Geno Atkins continues to infuriate owners as he had his 2nd zero point performance in three weeks. There was some reason to expect a regression in his numbers as we knew teams were going to start double teaming and chipping him on a majority of plays. However, 2 total tackles and 1 sack three weeks into the season is a lot to stomach. I wouldn't drop Atkins unless you play in a SUPER shallow league, but I would consider benching him until he shows us he's still capable of producing like a DT1. We all know fantasy defensive linemen can be maddeningly inconsistent and more times than not, it pays to be patient with your studs. James Laurinaitis has been another significant disappointment to fantasy owners this season. He's been outscored by rookie teammate Alec Ogletree in every week so far and is now dealing with a knee injury. Although I think Laurinaitis' numbers will improve, he's probably not the LB1 he's historically been for us. Consider him more of a LB2/LB2- for the time being, especially during home game weeks. Justin Houston continued his dominant ways last week with 4.5 sacks, 2 FFs, and a FR against the Eagles. He has another very nice matchup against the Giants in Week 4 who just gave up 7 sacks to Panthers last week. In looking at other sites' weekly rankings, Houston is somehow still being undervalued in balanced scoring systems. Granted, he carries some risk in these leagues as the majority of his points come from sacks, but he's shown enough consistency in that area to be a high upside LB2. After playing nearly every down over the first two weeks of the season, WLB Zach Brown only played 32 snaps last week against the Chargers. The Titans opted to go with a dime package for a good portion of their defensive snaps with Moise Fokou being the sole linebacker during those sets. Although the Titans are likely to revert back to their normal subpackages against the Jets this week, you should downgrade Brown slightly as there's a chance his playing time gets cut moving forward. Akeem Dent was replaced in nickel packages by Paul Worrilow and consequently falls back into the LB4 tier for the immediate future. Joplo Bartu played every down but his play was less than inspiring and he should only be used as a low-end LB3 matchup play moving forward. 49ers ILB Patrick Willis was forced from Sunday's game against the Colts with a groin injury and did not return. He was replaced by Michael Wilhoite who played every down in his absence but made little impact in the box scores. Willis is "hopeful" he can play this Thursday, but I would have a backup in mind. 49ers president Jed York announced Sunday night OLB Aldon Smith will not play in Week 4 against the Rams and will be away from the team "indefinitely." Bears CB Charles Tillman left Sunday night's Week 3 game against the Steelers with a groin injury and did not return for precautionary reasons. He's not likely to miss any game time, but may sit out practices this week. LDE Ezekiel Ansah (DET) - In several ways, Ansah is starting to remind me of a slightly lesser version of Jason Pierre-Paul. He was labeled as "raw" coming out of college, but has made his presence known immediately with 2.5 sacks already this season. He's going to be inconsistent moving forward (as most rookies and linemen in general are), but he's only going to get better under the tutelage of line coach Jim Washburn and is worth a pick up in most leagues as his upside is too high to ignore. Now is the time to grab him. RDE Adrian Clayborn/RDT Gerald McCoy (TB) - Clayborn made an appearance in last week's waiver wire column but deserves another mention here. Considering he's managed a sack against two of the most well protected quarterbacks in Drew Brees and Tom Brady already, I'd say he's a very good bet for another one this week against the Cardinals and their shotty line. For those in DT-required leagues, take a look at Gerald McCoy as an option as well. LDE George Selvie (DAL) - Selvie gets a significant value bump with the recent announcement that Anthony Spencer will undergo microfracture knee surgery and miss the rest of the regular season. The former 7th round pick of the Rams has played well for the 'Boys and I wouldn't be surprised if he winds up with a 35/10/8 stat line come the end of the year. MLB Erin Henderson (MIN) - I was pumping Henderson as a sleeper for a good portion of the off/pre-season and for owners that felt the same and rostered him, it looks to be paying off. As the Vikings every-down MLB, Henderson has already registered 18 solos, 6 assists, 2 sacks, and 2 INTs. Expect the tackle production to continue. He's safe to use as a LB2 option. WLB DeAndre Levy (DET) - Similar to Henderson, Levy is a player who has been in the league several seasons but is finally getting a chance to play every down for the first time in the NFL. He's taken advantage of the increased snap counts and posted 21 tackles and 2 interceptions through the Lions' first three games. His tackle upside is limited however making him a low-end LB3 option during weeks you need an injury replacement or bye week filler. 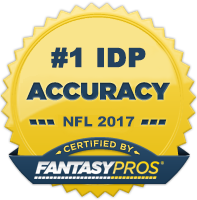 MLB Daryl Smith (BAL) - Smith was a popular value pick during this year's IDP drafts, however some folks quickly soured on him after back-to-back 3 solo performances. He bounced back last week with a very solid 7-3-1 stat line and his on-the-field play looked much improved. He doesn't have much tackle competition surrounding him, so as long as he can continue to play well and entrench himself as a defensive leader, he's a nice LB2+. If he's available in your league, he's most likely worth a spot on your roster. WILB Reggie Walker (SD) - Despite being listed as active, Donald Butler sat out last week's game against the Titans. Walker got the start in his place and played every down putting up 8 total tackles and a sack. If Butler is unable to go again this week, consider Walker is sneaky LB3 option against a Dallas team that is starting to place more emphasis on running the ball. SS Brandon Meriweather (WAS) - Since the departure of LaRon Landry, the Washington safety situation has been a mess. And it doesn't seem to be getting much better. After a nice start to the fantasy season, rookie Baccari Rambo was benched in Week 3 as the Redskins went to a lot of three cornerback looks with Josh Wilson playing free safety in base packages. I probably wouldn't trust any of the Washington safeties at this point, but if you need a desperation play, Meriweather is a good option if he can stay healthy. SS Charles Woodson (OAK) - Most IDP writers, including myself, thought that Usama Young would get the start at strong safety in place of the injured Tyvon Branch. However, it was Charles Woodson who slide down to the strong safety position with Brandian Ross getting the start at free safety. That said, consider the veteran Woodson a high floor DB2 playing behind a set of fairly average linebackers and on a defense that should receive good tackle opportunity. SS Major Wright (CHI) - Wright has averaged 8 total tackles per game since the start of the season and has flashed some big play ability with a FF and INT for TD last week. The Bears front seven isn't as strong as it use to be and that's allowing more opportunity for Wright to become a viable fantasy option. I think we see some slight regression, but I like him as a DB3 in moderately deep leagues. FS Rodney McLeod (STL) - Although McLeod hasn't shown anything from a big play perspective yet, he's been active in the tackle columns with 4-1, 7-0, 6-1 lines over the first three weeks. He has a nice matchup against the 49ers this week and is a nice DB3- matchup option in tackle-heavy leagues.